How to hatch Pokemon GO eggs efficiently? No cheating. Driving around won't work. It's not safe. If sitting in the passenger seat and stuck in a car in heavy traffic, you may be able to log steps by occasionally shake and move your phone allowing the app to check for new locations. Players have hired Uber and Lyft cars for hatching. 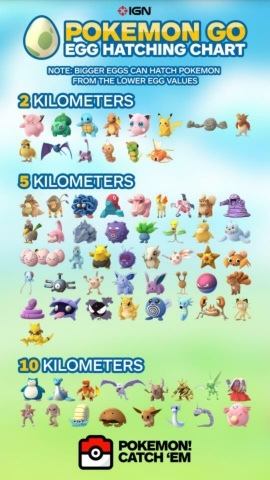 Below is a PoGo egg hatching chart - one of the many visual guides illustrating what each of the 10km 5km 2km eggs can potentially hatch. People have hatched 1800 Snorlax from 10km eggs. Some pokemons are easily caught in the wild than hatched. It depends on your geo location. Hatching eggs can help you log rare pokemons and those that are uncommon inyou neighborhood and unlock info cards in Pokedex. Pokemons hatched from eggs bring more candies than caught. Updated games are now less likely to crash but it also is better at catching players that are cheating. Traveling too fast won't log any mileage. Some players recommended traveling by bike. In some states using phones and engaging in other distractions may be completely illegal. You may not even be allowed to wear headphones while biking. It's not a safe method. Similarly other players considered roller skating.